The era that launched Joe Paterno and Penn State football to national prominence will be recognized at halftime today as the Nittany Lions of 1967-69 are staging a 50-year reunion. And make no mistake: The tradition of Beaver Stadium swelling to 107,000 started with these guys, who went unbeaten in 1968-69, beat the Big 8 champion in the Orange Bowl twice, finished No. 2 in the country both years and authored a 31-game unbeaten streak, longest in school history. The three-year nucleus included no fewer than nine All-Americans: Ted Kwalick and Dennis Onkotz, Mike Reid and Charlie Pittman, Neal Smith and Jack Ham, Dave Joyner, Lydell Mitchell and Charlie Zapiec. Two, Ham and Franco Harris, played their way into the Pro Football Hall of Fame. They joined a legion of other key contributors — Steve Smear and John Ebersole, Chuck Burkhart, Bobby Campbell and Jim Kates — who are household names among the Penn State faithful. Many will be on hand today in what is likely the last roundup of what most consider the foundation upon which the current program still stands. The team was built on defense. After losing six of his first 11 games, including the 1967 opener at Navy, Paterno started or quickly inserted seven sophomores into the next game at Miami, a win that he long considered one of the most important of his career. At that time, the dominant teams in the country were Notre Dame and Michigan State, and Syracuse was the Lambert Trophy frontrunner. Mainly through their defense, the Nittany Lions changed that perception. As Smear and the other old Lions have watched this year’s team drop interception after interception — certainly helping to cost them the Michigan State game — they could only shake their heads. The Nittany Lions’ interest base grew locally because Reid and Ebersole were from Altoona, and Smear and Ham were products of Bishop McCort in Johnstown. Smear felt the ’67 Miami game was a turning point because it signaled a youth movement. Veteran assistant coaches — Jim O’Hora, J.T. White, Dan Radakovich and Frank Patrick — were really good,” Smear said. Smear said teammates Don Abbey and Ted Sebastianelli organized this weekend’s festivities. Some haven’t seen each other in many years but stay in touch with the program by watching on TV. “I hardly ever miss a game,” Ebersole said. Reid has formed a relationship with James Franklin. He sent him a congratulatory text after the Big Ten title game in 2016. When Franklin was in Nashville a few months later, he called Reid for lunch and invited him to State College to address the team, which he did this past spring. “I’m totally impressed with James,” Reid said. “I think the direction is tremendous. From the point of view looking at a national program, they ought to be proud of what that man has done. Wins and losses are important, no question, but damnit, we either believe the program is about more than that or we don’t. As the new guard and the old guard share the same vision, the ones who have hit 70 are savoring their chance to grace the Beaver Stadium turf, maybe for the last time. “Greatest four years of my life,” Ebersole said. 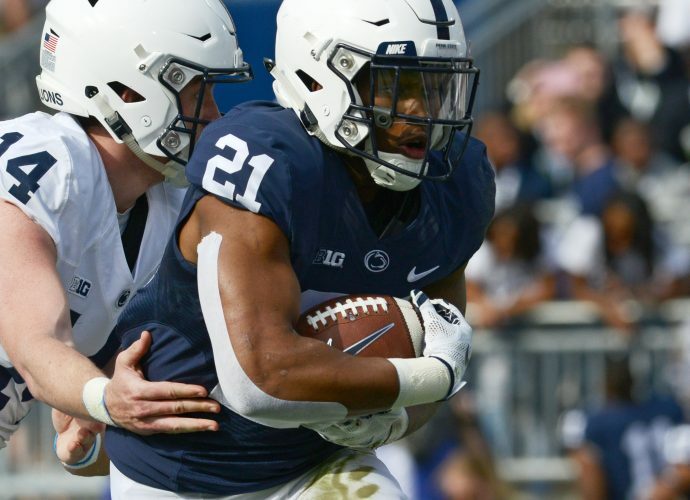 Neil Rudel covers Penn State football from the Altoona Mirror.